… Callisthenes… without prostrating himself, walked up to Alexander and offered to kiss him. Alexander, at the moment, was talking to Hephaestion, and did not trouble to observe whether or not Callisthenes had properly performed the act of obeisance, but one of the Companions – Demetrius, son of Pythonax – mentioned the fact that he had omitted to do so before going up for his kiss. Thereupon Alexander refused to allow him to kiss him. Arrian’s source for this anecdote is Chares, Alexander’s chamberlain. We know this because Plutarch names him as such when telling the exact same story (Life of Alexander Para 54). … it was easy for Hephaestion to be believed when he said that Callisthenes had promised him that he would do obeisance to Alexander and had then broken his word. When I first read this, it seemed to me that Plutarch was implying bad faith on Hephaestion’s part; or, to put it more baldly, that he was lying. When I read ‘to be believed’ I heard straight after ‘even though no such thing happened’. We know from the Philotas affair that Hephaestion was not beyond acting maliciously (see Curtius VI.11.15) but whether he is lying here I can not say. A feeling about a text – especially one that is a translation – is really not enough to convict a man. What I would say is that the postscript, if true, definitely provides proof that Hephaestion was not above manipulation. We should not be shocked by this. Indeed, we should not even be surprised: manipulation of one kind or another is part and parcel of all political systems and people’s lives. The polite word for it is persuasion. The real question is whether it is done honestly and for a good cause. As we have no proof that Hephaestion lied when he said that Callisthenes had broken his word we are bound to give him the benefit of the doubt and say that – at the very least – he believed he was telling the truth (if we go any further we risk slandering Callisthenes). Callisthenes appears to have been a rather proud man, perhaps one who was easy to dislike; Hephaestion’s actions, though, were more likely inspired by the fact that the court historian belonged to the rival traditionalist party – that is, those who opposed the king’s adoption of Persian customs and dress. To us, supporting the progressives in Alexander’s court, that is, those who stood alongside the king in his efforts to draw Greek and barbarian together, seems a straight forward decision. Such an inclusive policy is in perfect accord, after all, with dominant ideology of our own age. However, the matter is more complicated than that. It is not at all clear that Alexander intended Greeks and barbarians to be equal* (any more than it is clear in our age that some who profess to believe in equality really believe in any such thing). Personally, I think Hephaestion’s cause was not only good but necessary. Callisthenes had shown disrespect to the king and for the sake of Alexander’s authority this needed to be made known. If it wasn’t, Callisthenes’ power would continue to rise and Alexander’s, in however small a way, would fall. Why did Arrian not include Plutarch’s ‘postscript’? It could be that he didn’t know of it. If it came from Chares, though, maybe he omitted the story because it portrayed Hephaestion in what might be seen as a bad light. Up till now, the son of Amyntor has been portrayed in a wholly complimentary way. If that continues, I would definitely see this as an act of suppression. A few days ago I posted my thoughts on Chapter 5 of Mary Renault’s Fire from Heaven over at the Alexander the Great Reading Group on Facebook. You can find the post here. In this comment, the author talks about how ancient historians treated Hephaestion. Here is my response. As I wrote it, I started wondering why exactly Arrian portrayed Hephaestion in the way that he did. Unfortunately, the answer to that question died with him but it has made me want to look at Hephaestion’s portrayal throughout his work to see what kind of picture he paints of him not in one moment but overall. As I work (or write) my way through it, I will compare what Arrian says to the other historians. I would like these posts to be quite short so in each one I will look at just one ‘scene’ and sum up at the end. One account says that Hephaestion laid a wreath on the tomb of Patroclus; another that Alexander laid one on the tomb of Achilles, calling him a lucky man, in that he had Homer to proclaim his deeds and preserve his memory. Arrian presents Alexander’s and Hephaestion’s actions in an even-handed manner, neither mocking their arrogance for comparing themselves to Achilles and Patroclus nor praising the appropriateness of their actions. Instead, he simply gives the facts of what happened according to the two sources that he is using. This passage is testimony, therefore, to Arrian’s desire to write an accurate history of Alexander’s life. I think it also stands as testimony to his desire to treat Hephaestion fairly, too. It would have been easy for Arrian to omit mention of Hephaestion’s wreath-laying and focus only on the king’s, and yet, he chose not to do so. This is in contrast to Diodorus who says simply that Alexander ‘visited the tombs of the heroes Achilles, Ajax, and the rest and honoured them with offerings and other appropriate marks of respect’ (XVII.17) and Justin ‘He also sacrificed at Troy, at the tombs of the heroes who had fallen in the Trojan war.’ (XI.5). Plutarch writes the account that Arrian might have done if he did not care about, or wished to suppress, Hephaestion’s role. Once arrived in Asia, [Alexander] went up to Troy, sacrificed to Athena and poured libations to the heroes of the Greek army. He smeared himself with oil and ran a race naked with his companions, as the custom is, and then crowned with a wreath the column which marks the grave of Achilles; he also remarked that Achilles was happy in having found a faithful friend while he lived and a great poet to sing of his deeds after his death. Plutarch’s account makes me think that Arrian wanted to not only give an accurate account of Alexander’s life but also a full one, that is to say, one that does not omit mention of other people in Alexander’s life for the sake of keeping the narrative focused (which is what I think Plutarch is doing). 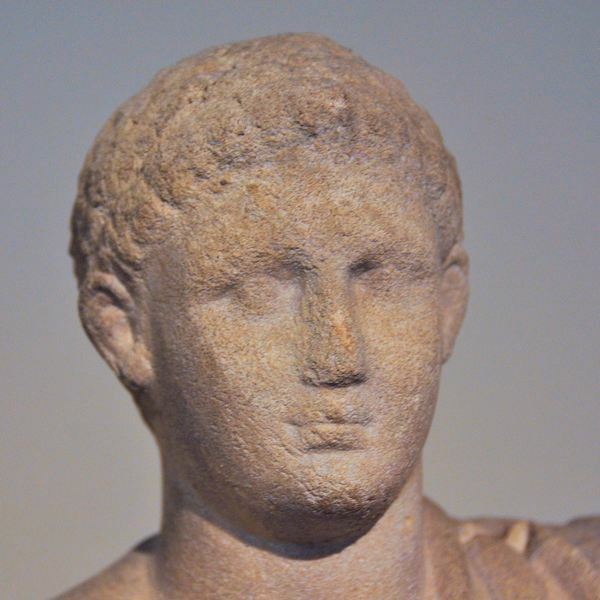 One final point – Arrian’s two principle sources are Ptolemy I Soter and Aristobulos. They are, in his opinion, ‘the most trustworthy writers’ (I.1) on Alexander. As Arrian doesn’t name his sources for the Troy story, I assume that neither Ptolemy nor Aristobulos mention it, but that the sources come from that part of the ‘popular tradition’ (Ibid) which he is happy to use (as it ‘may well be true’). If this is the case, the question that naturally arises is why don’t Ptolemy or Aristobulos mention it? I have no answer for Aristobulos as he is supposed to be a flatterer – but perhaps Ptolemy had no interest in Alexander’s Homeric pretensions. Given his position as satrap and pharaoh, it would be easy to understand why he chose to focus on Alexander, son of Ammon.